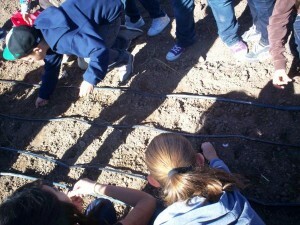 Ciudad SWCD is now offering the award-winning RiverXchange in-school water resources education program. RiverXchange connects 5th grade students in the middle Rio Grande watershed with partner schools around the world through the use of a private online blogging, allowing students to share their educational experiences. Ciudad SWCD Board members and Education Coordinators assist with classroom watershed health presentations, as well as with acquiring grant funding for the RiverXchange program. RiverXchange is a standards based curriculum developed for New Mexico to help fifth grade students understand watersheds, water in our society and river ecosystems. Students in New Mexico learn about stormwater, arroyos and the Rio Grande watershed through classroom guest speakers and experiential learning. Awareness of local water issues helps to empower students to make decisions regarding their local water resources. The RiverXchange program can be found in Albuquerque, Rio Rancho and Bernalillo Public Schools. Please contact Ciudad SWCD at (505) 225-RIVR(7487) or CiudadEducation@gmail.com for more information.